Address: Calle Hungria, Nº 6, Puerto del Carmen (Lanzarote), Islas Canarias. Located 400 metres from the sandy beach of Los Pocillos, Hyde Park Lane Villas offers a spa and wellness centre and a restaurant. It features self-catering accommodation with free WiFi. Featuring a furnished terrace with a private pool, the air-conditioned villas come with a TV, a lounge with a dining area and a fully-equipped kitchen with a dishwasher. They offer 2 bathrooms with shower and bath tub. A washing machine is also available. Guests can relax in the garden, complete with a children's playground. A small fitness centre is also available. An array of activities can be enjoyed in the surroundings, including water sports, golf and tennis. All guests receive a free welcome pack on arrival including a bottle of wine, tea and coffee. 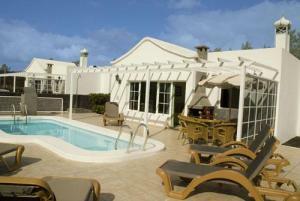 Hyde Park Lane Villas is a 10-minute walk from Puerto del Carmen’s city centre and from Rancho Texas Theme Park. Arrecife Airport is 6 km away. Please inform Hyde Park Lane Villas in advance of your expected arrival time. You can use the Special Requests box when booking, or contact the property directly with the contact details provided in your confirmation. This property will not accommodate hen, stag or similar parties.